Jewellery is like a luxury car…it requires care and servicing from time to time… gems and especially metals can wear with use…white gold rings are typically rhodium plated when bought and this coating can wear off over time giving a brown tone to the metal, claws on rings can receive the odd knock and become loose, the stones themselves can get chipped or even eventually fall out! One of the most common problems is white gold becoming browner with age and a simple Rhodium plating treatment can completely rejuvenate and regenerate your piece of jewellery. Rhodium plating transforms metal as it is very bright and mirror-like and reflects light. It is particularly good for diamond jewellery as it bounces light around much like diamonds do. Platinum is a naturally whiter metal and therefore does not discolour but loses its’ shine and becomes more matt, this can be buffed to return to its’ original glory. If you just want to change your jewellery from yellow gold to white gold then in many cases rhodium plating is the best option. You do have to be careful when rhodium plating jewellery that is set with porous stones as the plating process would adversely affect such stones such as peridot or certain treatments of rubies. Rhodium is in the platinum family of metals. It is rare and quite precious. 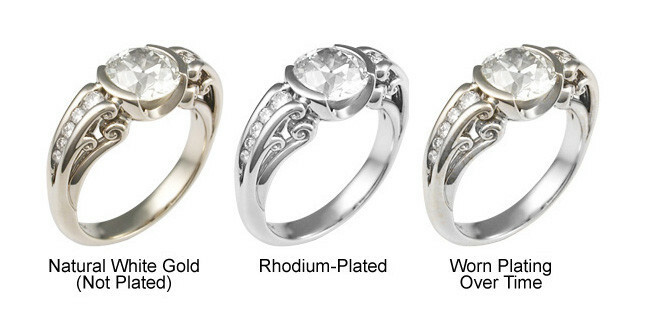 Rhodium plating, also known as rhodium flashing, is a process that coats a fine layer of rhodium over white gold rings to make them appear whiter and improve the shine. I have seen some jewellery from the Far East which completely changes colour when the Rhodium wears off and this is because they have used a poor quality of gold mix to make the original ring. How long does plating last? Rhodium plating is not permanent. 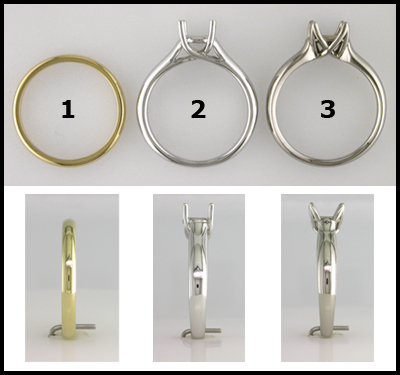 The time the plating lasts depends on how much the piece of jewellery is used and how thick the original plating was….a wedding ring which is worn everyday will require re-plating sooner than a pair of earrings which may retain their plating for many years. Can I change yellow gold into white gold? Yes….but we would need to chat about the stones in the piece and the fact it is not a permanent change! Surprisingly affordable, from as little as £40…I have clients who were overjoyed by the result and even one lady who said it looked better than when the ring was new!